While we do think Rachel would make an amazing Housewife, we understand the need to just focus on being out in the open with her fiancé (Bryan, Eric or Peter) after having to keep their engagement a secret for the last couple of months. Of course, previous Bachelors and Bachelorettes have gone on to compete on Dancing With the Stars, including the most recent Bachelor Nick Viall, but Rachel admitted she would be a little hesitant to sign up for the ABC reality competition. As much as I usually roll my eyes at Bachelor castings on DWTS, I would actually kind of love to see Rachel on the show – especially after Kaitlyn Bristowe spilled the tea on her own DWTS casting mess from a few years ago. I think she’d be a good partner for Artem or Gleb to really shine with. This week we have two routines to perform: a foxtrot and then our trio dance, which is a paso doble with [troupe member Brittany Cherry]. Sasha chose those two dances for this week because he wanted to show off both sides of my personality on one night. The foxtrot shows off my happy, cheery side and the paso doble is much more aggressive and intense. Getting to do the trio dance with Brittany has been a lot of fun. We love, love, love Brittany so much, and I really enjoy dancing beside her because she’s someone I’ve always enjoyed watching perform. I can learn a lot from her. The paso doble has been really great because it’s all about being sharp and aggressive, which is a lot more like gymnastics than most of the other dances I’ve had to learn for the show. ETA: Here is Sharna talking on her new dances with Bonner this week…. ETA2: Here is more with Emma and Rashad from Friday’s Access Hollywood interview…. Read more.. 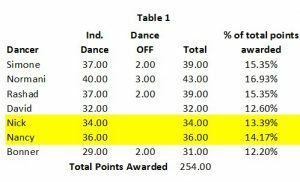 Dancing With The Stars Season 24, Week 7 – Dancing by the Numbers! Ya gotta look at that leader board and think they have it ranked how they would like it to go, right? I don’t think they’re going to get their wish, and this coming week the judges scores could be quite illustrative as to what the current agenda is. Anyway, my record isn’t great this season, but it’s been so stellar in previous seasons (pats self on back) that I keep plugging away. But it does beg the question: what is different this season?? As I’ve said in the comments, I think it’s that 2 or 3 contestants are getting such a lion’s share of the votes, that everyone else is vulnerable EVERY week. One bad score and you’re gone. Now, before you jump to the conclusion that Bonner must be getting a ton of votes, remember it’s not just who’s getting votes, but who ISN’T getting votes. Bonner was not at the bottom last week so Nick had to cover the spead (and couldn’t) and Bonner only needed 7,500 more votes per million votes cast to beat Nancy – that is NOTHING. Chump change. David also needed very little to cover the spread between him and Nancy and he obviously did because he’s still there. What does all this mean? Well, nothing, anymore. 🙂 It’s a new week now and they’ve kinda jury rigged the leader board to protect one person and make it hard for our dark horse – Bonner – to continue to stick around. There is no more low hanging fruit, I don’t think – he’s it. They’ve given EVERYONE except Bonner and David nice fat cushions so they should be safe. SHOULD BE. These kinds of margins have been beaten before and this is a week that could make things interesting. I would put some money on them putting Bonner and Normani in jeopardy and then sending Bonner home – stimulates the Harmonizers for next week when she’s much more likely to need the votes and it creates lots of drama. Anyway, I skip ahead. What are Bonner’s chances? He needs less than 4k votes per million votes cast to stay over David. I know I say this every week, but I just don’t see that happening. David is a freshly retired Cub. They play his dances with Lindsay during rain delays…he came within 8% of Rashad on the dance off, which is quite an accomplishment. Side note: Speaking of the dance off, did you notice that the judges never did a split decision this past week? They almost always have at least one of those…and they should have had a least one of those because they were close in dance quality in most places. Makes you wonder if they were DETERMINED to make sure that America didn’t screw up their decision…perhaps they are afraid of what might happen this week? They gotta be gun shy after losing Heather and Nancy. Anyway…there isn’t a lot more to say. Bonner only needs about 4k more votes per million votes cast to be safe over David, and if he can’t beat David then he needs nearly 32k more votes per million votes cast to beat either Simone or Rashad – it’s not that that’s a huge spread, it’s that is Simone and Rashad. I would literally be actually shocked if Bonner were to stay over either of those two. I just don’t see it happening. If he were to beat Normani, it would mean he got more than 47k more votes per million votes cast in order to stay. It has happened in the past, for sure – but Bonner isn’t on the same level as Mark Warner and Normani is a bit better off than Audrina (I think…). I find this to be highly unlikely…which means Normani is probably safe, along with Simone and Rashad. That leaves us with Bonner and David, and I think David is still raking in the votes to the point that Bonner can’t cover the spread. 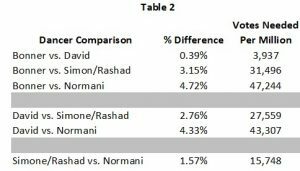 Simone AND Rashad would each have to get 15,800 more votes per million votes cast than Normani. Simone or Rashad DON’T get 15,800 more votes per million votes cast than Normani. Peta Murgatroyd and Nick Vaill talked to US Weekly about Dancing With The Stars and their elimination. Nick thought he was going home every week, but, he and Peta kept at it. Nick is glad it lasted as long as it did. More at US Weekly including talk on Peta and Maks’ wedding plans this summer and more. Also, here’s a really sweet video of Peta and Maks talking on being first time parents. So cute.